Whirlpool Corp. announced plans in November of last year to build three wind turbines to power its Kitchenaid manufacturing facility in Greenville. The three turbines are expected to offset approximately 70 percent of the Kitchenaid plant’s electricity consumption. Findlay-based One Energy Enterprises will set up three $5,000 yearly scholarships for local students interested in pursuing a STEM degree. GREENVILLE — Darke County residents may have noticed some changes over on the north side of Greenville in the past few weeks. Whirlpool Corp. announced plans in November of last year to build three wind turbines to power its KitchenAid manufacturing facility in Greenville. 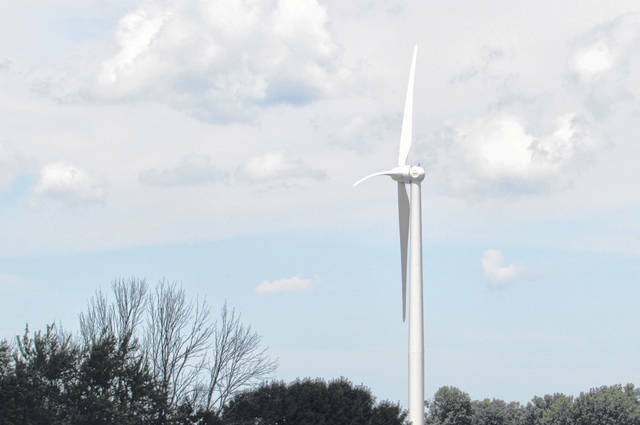 Beginning construction earlier this year, the turbines are similar to those developed for Whirlpool’s facilities in Findlay, Marion and Ottawa and were designed in coordination with Findlay-based One Energy Enterprises. The three Greenville turbines are expected to offset approximately 70 percent of the KitchenAid plant’s electricity consumption, eliminating the equivalent of more than 9,000 annual tons of carbon dioxide. This is equivalent to generating enough clean energy to power more than 900 average American homes, according to a press release issued by the company last year. The turbines are expected to go online at the end of August. One Energy Head of Storytelling Angela Deboskey said an unpredictable summer has slowed down construction of the towers somewhat. 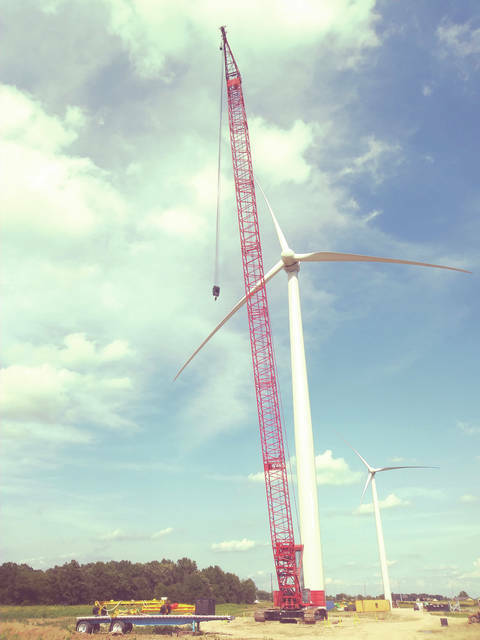 Technicians from One Energy have developed, engineered and constructed the turbines, Deboskey said, and the company will continue to own and operate the structures for the next 20 years while charging KitchenAid a monthly electric bill at a locked-in rate. The KitchenAid plant will use power from the turbines before pulling any energy from Greenville’s electric grid. 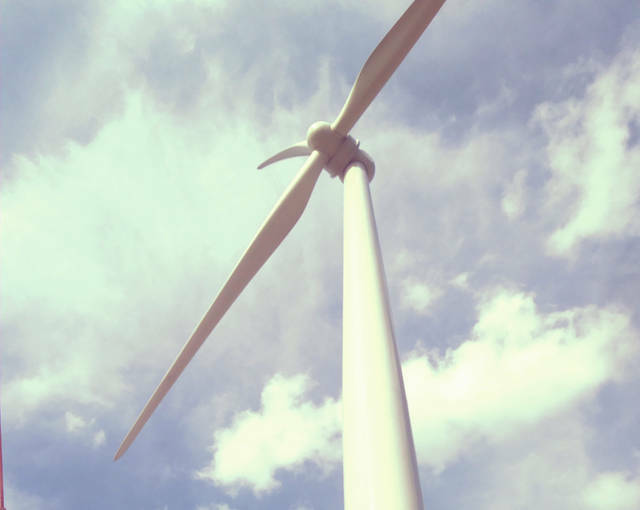 One Energy designed the wind turbines for Whirlpool’s other Ohio facilities as well. According to Deboskey, the towers will help offset a good deal of the facility’s carbon dioxide production. “Whenever you can reduce carbon emissions, that helps out all of us,” Deboskey said. The company’s willingness to sign a 20-year contract also should be seen as a sign of its continuing investment in Darke County, Deboskey said. “That’s a commitment to the community, that they’re planning on sticking around that long,” Deboskey said. And One Energy plans to invest in the community as well, Deboskey said, by setting up three $5,000 yearly scholarships for local students interested in pursuing a STEM degree. Names of the scholarship recipients will be placed on plaques at the base of the turbines each year. This entry was tagged Greenville, kitchenaid, Whirlpool, Wind turbines. Bookmark the permalink.